I grew up as the daughter of a veterinarian. I have a natural passion for animals, and dogs in particular, but it wasn’t until I rescued Dunkin, my now 13-year-old pit bull, that my passion for dogs grew into a devotion to all pit bull type dogs. 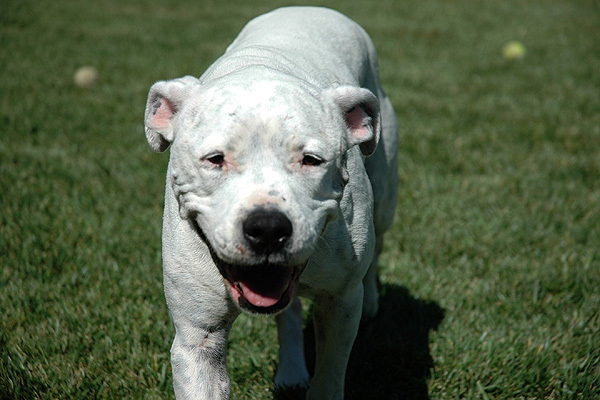 Dunkin (photo above) was a 7-week-old white puppy – he looked like a little piglet – when I met him. I had graduated college and was ready to move to NYC on my own. I was determined to get a dog that could look scary and protect me from the unsavory characters and whatever hazards would lie ahead. Everyone I knew, including my parents, had warned me not to get a pit bull. 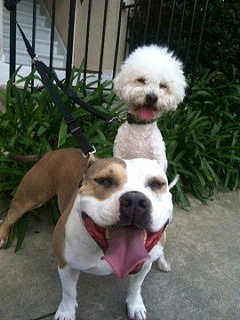 Their perception of pit bulls was that they were aggressive, dangerous and unpredictable animals. As usual, I ignored everyone’s opinions and did what I believed was right in my heart. As Dunkin (named after my favorite Dunkin Donuts) grew, the only thing that was unpredictable about him was how many kisses and wiggles he would give to every passerby. Night and day, we had to stop so that he could lick the children walking by and press up against adults until they gave him a pet. “This is a pit bull? Can’t be!” was what I heard constantly. Meanwhile, other people with their misconceptions would give us dirty looks and cross the street disgusted at the site of Dunkin’s big white head. He touched everyone who was open minded enough to pet him. Even my parents missed Dunkin so much that they rescued their own pit bull, Emma –another love bug. I was employed as a pharmaceutical sales rep, and I spent most of my time off volunteering with dog rescue organizations. 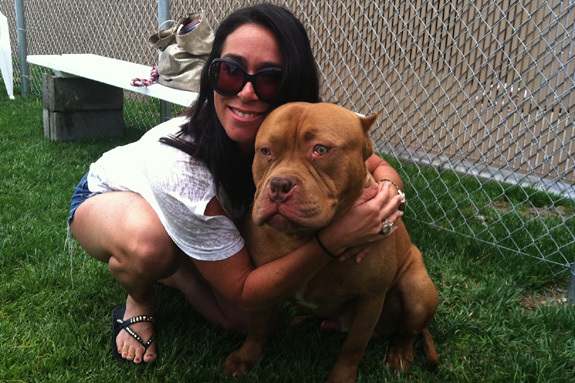 It was a harsh reality to learn that the majority of the dogs in the shelters were pit bulls. 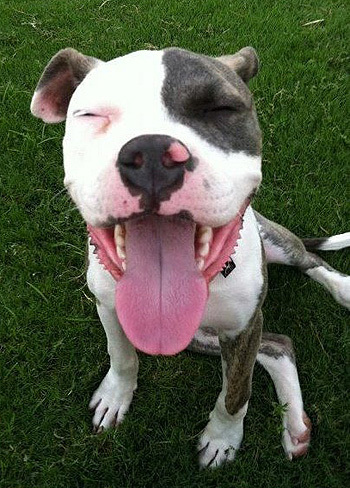 Due to time and space limitations, many pit bulls have just five days to be adopted or can be euthanized. I helped the rescues take some of the pit bulls out of the shelter and to adoption events. There were traits that these pit bulls had that I didn’t see with many other dogs – and I grew up with six dogs. Their eyes always look sad and human as if to say, “I love you so much.” They are typically quiet in their kennels unlike their counterparts that bark uncontrollably, and it is not uncommon for them to wrap their paws around you and kiss your face endlessly! In fact, you would be hard pressed to find someone who has had a pit bull and does not only agree with the description above but says that they will have pit bulls for the rest of their lives. I continued my volunteer efforts with dog rescues in Los Angeles while I kept my day job. During an adoption event, I met Izzy, (photo right) a brown and white stubby Staffordshire Terrier, and once again those human eyes and uncontrollable wiggle hooked me. I learned that Izzy had been purchased for $2,000 dollars, her ears inhumanely cut to look tough, and a gang had been training her to dog fight. Izzy did not have the aggressive nature that is needed for dog fighting. A compassionate gang member who fell in love with Izzy felt she was headed for a disaster, so he decided to sneak her out in the middle of the night and dropped her off at the front steps of a dog boarding facility that specializes in pit bulls. Izzy became Dunkin’s little sister and best friend. She is a great companion and the love of our lives for all of us. It was at this point that I mustered up the courage to leave my pharmaceutical job and create my own dog rescue organization, Wags and Walks. An overachiever with a can-do-anything spirit, I knew that I could do more for animals. My overall goal is to educate people that there are sweet, healthy family friendly dogs in the shelters. Our organization promotes animals that are left behind for various reasons and is committed to finding them suitable, loving, fosters and adopters. We visit shelters daily, sometimes 60 miles away, and focus on the dogs’ temperaments. We take pictures and video, and urgently network to find these dogs homes before they run out of time. To date, we have helped save the lives of over 35 great, special dogs that will bring happiness to families. Although we admit to having a soft spot for the pit bulls, as we feel they need our voice more than any other breed, we want to save all breeds. In fact, roughly 30 percent of animals in the shelter are pure breeds. We have come to the realization that it is easy to find a beautiful, sweet dog. The challenge is finding the people who will help. We know that people want to help save animals and many just don’t know how. 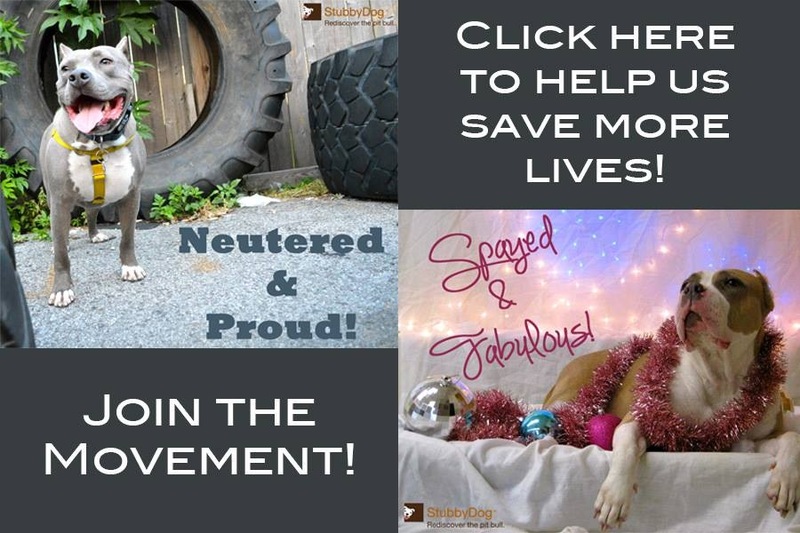 To save one dog takes people willing to share its photo and story, donate funds, provide a ride for the animal, a leash, collar, bed, crate, etc. We are proud of all the animals we have saved, yet there are thousands more that are put to sleep everyday. We ask that you join the movement in any way you can. We are committed to saving as many lives as we can, and the more support we have, the more we can do.